With the current state of modern medicine, getting a cut, sprain, or broken bone is no longer the death sentence that our ancestors faced. With proper medical attention, you can get patched up and on your way in no time. But what do you do if these medical systems fail, are destroyed, or are jammed with other survivors? How will you make sure you or someone you love doesn’t die unnecessarily? The best way to insulate yourself from this type of tragedy is to make sure you learn some basic survival first aid. First aid is an invaluable skill set to learn and to help get you started we have teamed up with Dr James Hubbard of TheSurvivalDoctor.com. Besides being a practicing doctor for the last 30 years, Dr Hubbard has also published five easy to understand books on survival first aid (see them here). 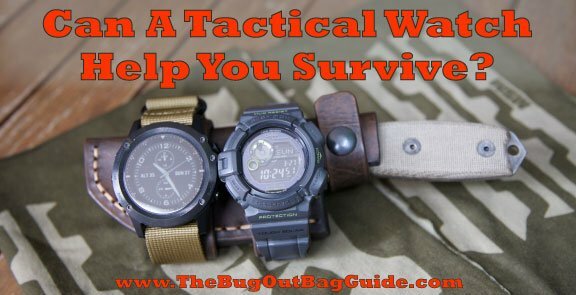 In this article he walks us through some basic problems that are likely to occur in a survival situation and what you can do to save lives when it matters most. What are the 3 basic First Aid skills you should learn for a survival scenario? JH: The skill I most recommend learning is how to stop a wound from bleeding. Most of the time, applying pressure to the wound will work. Also know how to use a tourniquet. Learn abdominal thrusts for choking. A person can die from choking within minutes, so even in normal times, when emergency services are available, this technique can save a life. A third important skill is the skill of improvisation. Remember to use what you’ve got. If you don’t have the perfect medical equipment, you may be able to make it out of something common. For example, you can make a decent tourniquet from a belt or a T-shirt. I go over a lot of other ideas for makeshift supplies in the book. JH: That is important to know, but a lot of people are surprised to learn that CPR is only going to keep you alive for a certain amount of time. So it’s most helpful if emergency services are on the way or if you have access to an AED—automated external defibrillator. A lot of public places and even some homes have them. The longer you keep doing CPR without a defibrillator to restart the heart, the less likely the person is to survive. Experts say to do CPR until you’re completely exhausted. I agree, but in truth, after about ten minutes, the person is unlikely to survive. Exceptions are victims of hypothermia and drowning. They’re likely to live longer, without irreversible brain damage, because they have lower metabolism—less need for blood and oxygen. Some people, especially children, have survived after multiple minutes—even an hour—of having CPR. What’s your number-one piece of survival equipment? JH: Besides my book, I’d say the brain—knowledge. You’re not always going to have the specific equipment you need. If you have knowledge, you can improvise. What are your top-five must-haves for a “go” bag? JH: Vinyl gloves to protect yourself from infectious disease and fluids. I like vinyl because some people are allergic to latex. It’s better to buy too large than too small because you can always get a larger size on. And if someone else is using the gloves, they may have bigger hands than you. You could improvise by putting any type of waterproof material over your hands. I like to keep some SAM Splints. They’re flexible splints that become rigid when you bend them. They’re so versatile, and you can use them for many types of sprains and broken bones. Have some elastic bandages to use on sprains. They help with stability and with compression, which in turn can decrease swelling. With compression, watch the circulation though; your toes or fingers shouldn’t become numb or cold. You can also use an elastic bandage to keep a SAM Splint in place. You’ll need bandage scissors or any type of strong scissors that can cut cloth, tape, and the SAM Splint. And throw in some tape. Duct tape is my favorite. It’s a good waterproof, very sticky type of tape. However, any type of tape will do—the stickier the better. You can use it on bandages or to cover a wound after putting down some sort of cloth or padding. If you have to walk for help and your shoes are causing blisters, put duct tape in the shoes on the pressure points to relieve the friction. Duct tape does have latex in it, so it’s good to keep a latex-free option in case someone is allergic. One reason I like these supplies is you can use most of them in multiple ways for multiple problems. I live in a busy city and never go hiking; do I really need these skills? JH: Yes. There’s always the risk you won’t be able to get medical care due to natural disasters, upheaval, or all kinds of other things. A few years ago, there was an episode in England when some city dwellers, because of riots, were not able to get medical treatment in a timely manner. Ambulances were overwhelmed with calls, and it wasn’t safe to go into the streets and try to get to help. For unsafe times like that, the book also gives hints on when you really need to get to the doctor if that’s possible and when it can wait. Even in ideal times, with emergency services just down a couple of streets, that first few minutes before they reach you can save a life. What are some common household items you can use to treat a cut or wound? JH: You can stop the bleeding by applying pressure with any clean cloth material, like a T-shirt. Wadded up, the material can apply deeper pressure than your hands would to a rough wound’s nooks and crannies. You can clean the wound with drinkable water. Or many types of clean liquids will do. And you can tape the wound with duct tape if the person isn’t allergic to latex. Not all wounds should be closed, but for those that do, a specific taping technique, which I go over in the book, can substitute for stitches if necessary. What’s the main concern with broken bones and dislocations? JH: The main concern is usually blood and nerve supply. If the bone is out of place, it can press on a nerve or blood vessel, and you could develop permanent problems. If blood flow is stopped, you could even lose the limb. In the book, I go over ways to check for these problems and try to fix them or minimize the damage, at least temporarily, if you’re unable to get professional help. If you’re dealing with an open fracture, a main concern is infection. “Open fracture” means a broken bone has gone through the skin—maybe only briefly before going back in. This puts you at high risk for a serious bone infection. How can you tell if someone has had a concussion? JH: If a person has had head trauma—from either a hit or a jerk of the head or neck—and then has any symptom caused by that trauma, they probably have a concussion. Many years ago, we thought you had to be knocked unconscious to have a concussion. Now that belief has changed, and we know there can be at least temporary brain damage with much less. For example, you might be dazed, have a headache, feel nauseous or dizzy, or have trouble sleeping. These are just some of the possible symptoms of a concussion. What’s the first thing you should do if you get bitten by an animal? JH: Get away from the animal! If we’re talking about wounds: If it’s dangerously bleeding, stop the bleeding. Wash the wound out well with water. Do not close it or get it sutured. Animal bites are especially prone to infection, and closing the wound will give those germs a nice breeding ground. Keep it open so you can regularly clean it and so your body can get rid of some of the germs. With most normal wounds, cleaning with plain water will suffice. But for animal bites, there’s some indication that Betadine-type solutions work better when you’re trying to wash out rabies germs. If you get bitten by an animal: FIRST get away from the animal, then do what you can to avoid infection. What do TV shows and movies get wrong about CPR? JH: The actors don’t press hard enough—because they can’t. You’re supposed to press the chest down about two inches, but you don’t want to do that on a living actor. Also, the actors usually still do artificial respirations with the chest compressions. Today, it’s recommended that in most circumstances, when laypeople perform CPR, they only to do the chest compressions. Exceptions are when you’re performing CPR on children younger than puberty or on drowning or drug-overdose victims. Also, in the movies and on TV, people come back to life just from chest compressions. In real life, that’s basically unheard of. It’s very, very rare. You do the chest compressions in order to keep the brain alive until you can shock the heart back. Don’t do what the TV Doctors do. Especially this guy. Where is the best place to be in a thunderstorm to avoid getting hit by lightning? JH: In the inside part of a house—away from windows—or in a car. If you’re in the woods, there’s no great place. Some experts have said to keep walking, so if lightning strikes you, hopefully one foot will be up and one down and you’ll be grounded. Others have said squatting on the balls of your feet, heels together, head down, hands off the ground, will help. These theories are debated. I think the best idea is to stay away from metal poles and structures, and make sure you’re not the tallest thing around—or beside the tallest thing. Squat under a low-lying group of short trees. People don’t usually die when they get struck. They sometimes have burns. There will be a boom that can cause hearing loss. They can have abnormal nerve troubles and are prone to get depression later on. Can you really drink seawater, urine, and blood? JH: Yes. It might help very short-term—meaning several minutes or so; it may get you out of a dangerous situation. But after that, it’s going to do more harm than good. There’s too much concentration of chemicals in these fluids. Your body will try to dilute those out, so you’ll urinate more than usual. In turn, you’ll become more dehydrated. Also, you’re putting toxins into your body. With urine, your body has just expelled those chemicals because it doesn’t need them. They’re not like a poison; they won’t kill you immediately. But they’ll be more concentrated in your body and will affect your kidneys in multiple ways. As you can see, there are a lot of skills we can learn to improve our chances of survival. If you are interested in this topic, start off with the basics and build your survival skill set from there. This is a skill that no one ever regrets learning. Always remember, Chance Favors The Well Prepared. I definitely suggest you check out Dr Hubbard’s latest book, The Survival Doctor’s Complete Handbook: What to Do When Help Is NOT on the Way. It is a fantastic resource for people wanting to learn the basic survival first aid skills you need to survive. Is there a survival first aid skill you think everyone should know? Do you have a piece of first aid gear that is a must have for a bug out bag? Let us know in the Comments Section below, thanks! One of the most important things to stock in your home and pack in your bug out bag is your first aid kit. 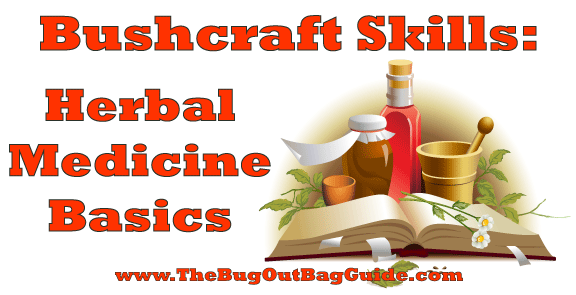 One way to keep your first aid kit full when bugging out is to learn herbal medicine foraging skills so you can identify and harvest useful natural remedies as you move. A person’s health is, after all, essential to survival and should always be a top priority no matter what the situation is. In this article we are going to teach you how to find and use 12 life saving herbs that can be used to treat illnesses, alleviate pain, and give you energy. The best part is that ALL of them can be grown at home of found in the wild at little to no cost! Way before our reliance on pharmaceutical products to help improve our health, our ancestors relied on herbs and other natural products to alleviate their illnesses. Many people are already starting to build and grow their herbal medicine chests to create an at-home pharmacy. In addition to making sure that only ‘organic and chemical-free’ elements enter your body, another advantage to creating an at-home herbal medicine chest is that it ensures a constant supply of alternative medicine during emergencies. How do you start herbal medicine foraging? It will take years for one to master the science of medicinal herbs, so the best thing that one can do is just figure out what the are the most needed items (check out our list below to see what you may need). Once you have done this it is time to start putting that knowledge into action! Go out and try and find some of the herbs you think you may need in the future. It is never too early to start building up a stockpile. Echinacea – A popular herb, also called as the coneflower, is the best in the list when it comes to fighting colds. What is even better is that aside from being a great plant for boosting one’s immune system, it is also a beautiful plant that can prettify your garden. These flowers naturally grow in Eastern and central North America, in moist to dry prairies and open wooded areas. Astragalus – When it comes to the Echinacea’s best partner in boosting the immune system, the Astragalus is on top of the list. Also, the herb also comes with antimicrobial and antibacterial properties essential in getting back to good health. For conditions related to colds and flu, diabetes, heart diseases and even side effects of chemotherapy, the root of the Astragalus can be used. It grows in the wild along the edges of woodlands, in thickets, open woods and grasslands and is hardy enough to survive a North American Winter, should you decide to plant it in your garden. Licorice – Although it is super sweet, chewing on licorice root is the best remedy for a sore throat. You can create a tincture or decoction for this, or you can keep licorice ‘sticks’ handy in your herbal medicine chest. Licorice grows best warm climates in deep, rich sandy soil near a stream in full sun. Chamomile – Chamomile is the go-to herb for those with belly aches. It is also best made into tea and drank in the evenings, along with honey, because of its calming effects. Chamomile grows along fence lines, roadsides, and in sunny fields from Southern Canada to Northern U.S., the plant does not tolerate hot, dry climates. My Mother used to make me Chamomile when I had a stomach ache and I still use it! Wood Betony – This plant belongs to the mint family and is best used against stress and headaches. It is also great for covering up wounds to relieve it from soreness and inflammation. As you start growing your wood betony, make sure to protect them from harsh conditions and the wind and transfer it only to a herb garden once it has been established. Wood Betony typically grows in woodlands and in copses of trees, although it can occasionally be found in more open areas. Calendula – This pretty little flower can be eaten and mixed with muffins. Yum! But, aside from filling your tummies, the Calendula is also used to soothe one’s skin. They are used to help heal and soothe rashes. You can make a salve out of it so you can easily grab it to use regularly. Calendula is also very mild even for kids to use. It can be found growing in the wild in open fields and prairies. Feverfew – Just like the wood betony, feverfew is also great for headaches and can help dilate the blood vessels. You can take this one as a tincture or tea. Feverfew is commonly found along roadsides and along the borders of wooded areas. Elecampane – As a member of the sunflower and ragweed family, the Elecampane can grow as tall as five feet. Aside from stimulating the digestive system, it is also used to relieve congestion. Elecampane grows abundantly in pastures and along roadsides, preferring wet, rocky ground. Horehound – Although horehound is among the best herbs for coughs, they are extremely bitter and will require lots of sugar – or honey – to make it easier to one’s taste. Horehound is a hardy plant that thrives in full sun and needs little moisture, it usually grows along roadsides, in disturbed areas, and in fields. Valerian – The root of this herb may not smell its best, but it works very well in a tincture or decoction for relaxation due to its sedative properties. Valerian likes moist soil and its native habitat is marshes and river banks. Marshmallow – Nope, this is not the sugary stuff that we all love to roast in the campfire. In fact, this herb works as a mucilage to coat both the throat and stomach. It is also used for its anti-inflammatory properties. Marshmallow plants grow in sunny but cool climates on the edges of marshland and on grassy banks along lakes and rivers. Comfrey – This herb, which is also known as bone knit, is great only for external wounds. It should never be taken in as it can be toxic to the liver. Simply mash the leaves and soak them in hot water for a few minutes then wrap the soaked leaves around the wounded area. Aside from this, comfrey is also recommended to be planted around fruit trees as it aids in pulling up calcium and minerals from the soil. Comfrey most commonly grows in in damp, grassy places. Although it likes damp soil it’s root is hardy enough to survive a minor drought. How are these herbal medicines used? Any of the medicinal plants listed above can be used to cure ailments in different ways, except for comfrey which should only be applied externally. Among the most popular ways to use herbal medicines is to make them into a tea. To do this, one simply needs to create an infusion by boiling water and adding the leaves into it. Steep it for about 10 minutes (but going longer is okay as well), strain the herbs and use it as your drink all throughout the day. As for the roots and bark, one can create a decoction by adding a handful of the dried or fresh herb into a pot of water. Let it simmer after boiling then strain the herbs out. The decoction can be kept for a day inside the fridge but is best used within the day. To create tinctures, you can use alcohol to get the oils out from the herbs and preserve them. It is recommended to use dried herbs and enough vodka or brandy to soak it to about a quarter inch. Shake it every day for one month to eight weeks then strain and bottle. The regular dose of a tincture is about 30 drops for three times each day. Growing, creating and using medicinal herbs can be a lot to take in but it can get easier once you get used to it. In time, your garden will not only make your house beautiful but will keep your family healthy as well. The Lost Ways – A site dedicated to uncovering and learning the primitive skills of our pioneering ancestors. Good resource all around. CLICK HERE NOW to check it out. Bushcraft Skills: Foraging For Food – This article teaches you all about foraging and trapping techniques. An outstanding skill to learn alongside the ones in this article about making natural remedies. Click here to read it. How To Build Your Bug Out First Aid Kit – What to pack and how to choose the first aid kit for your bug out bag or any other survival situation. Both methodology and gear recommendations are included and there is a FREE downloadable checklist to help you along. Click here now to check it out. Do you have a natural or herbal medicine that you use? Do you think this is a good skill to add to our survival knowledge? Do you have a herbal medicine foraging tip to share? Let us know in the Comments Section below, thanks! Lisa Farland is a writer at Happy to Survive – a blog that will help you thrive and survive, and offers articles about preparedness, and off-the-grid, self-reliant living. Lisa is an avid minimalist camper, prepper and survivalist. In a long-term survival situation, you may need to fashion your own cooking and eating tools from whatever is available. 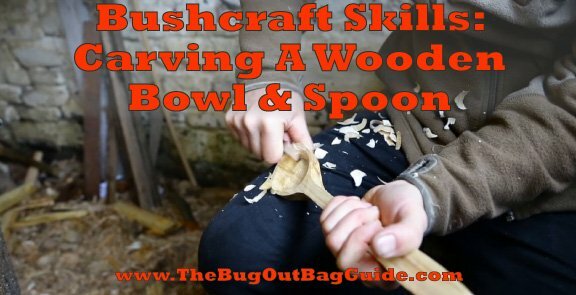 This article will give you a step-by-step tutorial on how to make a spoon and bowl from wood that you can scavenge or find. The wooden bowl and spoon are a good starting point for making tools as well as a useful introduction to wood carving. Carving them will teach you the primary skills you need to implement when creating other useful utensils. I suggest you start off with this basic project and then expand from there based on your personal needs. This is a great skill for people of all ages. Kids find whittling fun and adults often find it relaxing so let’s get started! Wooden spoons and bowls were some of the first tools carved by our ancient ancestors thousands of years ago. They were valued for their ability to help prepare, cook, and eat food. In modern times, we have the advantage of having metal tools and a seemingly endless supply of wood carving and whittling resources online that help us perfect our craft. It helps to choose a block where the fibers in the wood run straight and parallel. Basswood and other soft woods are common choices as they are easy to use and allow you to make precise cuts without needing to apply a lot of force. Begin by taking your axe/hatchet and evening out one side of the wood. You’ll need to refrain from striking the wood. Instead make precise and controlled cuts with the grain. Following this, use your knife and continue making controlled push cuts until the grain is even enough to draw the outline of a spoon on the flat side of the wood. A push cut is a whittling technique where the carver holds the object being carved in their off hand and the knife in their dominant hand while making strokes away from themselves to remove the desired amount of wood shavings from the block. In our case, it would be to make one side of the wood flat. Once you have the side flat, draw a rough outline of a spoon. Visualize how small or big you would like the spoon to be and make a rough sketch of it on to the wood. It doesn’t need to be nice and pretty, just obvious enough to give you a visual barrier throughout the guide. Whatever knife you use, make sure it is SHARP! Dull knives become extremely susceptible to accidents when carving since they are more prone to slip and cause you to lose control. Take care of your tools and they will take care of you! After drawing your rough outline, you will want to position the wood vertically with the handle side pointed downwards. You are going to be carving with the grain so start removing material downwards with your knife. The goal here is to remove wood shavings along the edge where the handle and the head of the spoon meet. Aim to remove small portions of wood instead of hacking off chunks. This will leave you with a larger margin of error should you slip. Carving is all about maintaining control of the knife, this is necessary for the item being carved and for the safety of the carver. Do not carve on the drawing or against the grain. If you go against the grain it could very well split the wood and ruin it. Leave just enough space, about a 1/2 inch, between the edge of the wood and the outline of the spoon. Take care of your tools and they will take care of you! Flip the spoon over so that the head of the spoon is now pointed down. Use your knife to make push cuts and thumb push cuts around the top part where the spoon head is located. Leave about an inch of space between the edge of the wood and the outline of the spoon. We will be drawing a line outside our previous rough drawing to determine the thickness of the edge. Be careful carving end grain, this is where people are most likely to cut themselves. Stay mindful of where your hands are and how much tension you apply when making cuts. With a hook knife, make controlled downward scoop cuts while pushing the blunt part of the hook blade with your thumb. Think of it as if you’re scooping ice cream from a bucket, at first you’ll need leverage from your other hand to get the initial scoops, and the further into the wood you get with the hook knife the easier it gets. Eventually, the head of the spoon starts taking the shape of the hook knife. Afterwards, take a carving knife and do thumb push cuts to shave off the side material so it is flush with the outline. Even out one of the sides flat enough to draw the spoon’s profile. Once the side profile outline is complete, carve off the excess material to finalize the shape of your spoon. The final and most time consuming part is sanding down the project, which is to help create a more detailed and aesthetic finish to the final result. When you reach this step, ideally, you’ll use a low grit sandpaper, a medium grit, then a high grit. I use a 400 grit to help get rid of all the uneven cuts, then an 800 grit to shape the spoon/bowl, and finally the 1200 grit to finish it all out so that it looks nice and clean. The steps in making a wooden bowl are quite similar to the steps explained for making the spoon. The tools we will use will be slightly different while the size and thickness of the piece of wood will be larger. Generally when making a wooden bowl, as with the spoon, you start by selecting your wood. We can carve our bowl in any size or style we like, so choose a block that will match what you are going for. The outline will be a guide as you remove bulk pieces from the wood during the first stage of carving. Use a tape measure to mark the desired thickness of the edge of the bowl, this will help maintain consistency all the way around. Once you attain measurements, draw an outline that connects all the marks into two concentric outlines. If you want a large bowl, then the lines should be about an inch apart. With the adze tool, make downward cutting motions similar to when using a hatchet for removing large portions of wood. Don’t constantly cut one way, you will need to cut from opposite angles in order to evenly cut your bowl to a desired depth. As you progress deeper, the cuts will need to be more precise to prevent from cutting too far. Once you are happy with the depth you have carved, even out the inside as much as you can with the adze tool or a straight carving knife. Either work fine, but I prefer to switch over to a carving knife since it is more accurate, which makes this process easier. Ensure that the wood is secured to your work surface and then begin to remove the outside wood carefully. You will be working towards the outline you drew on the top and the base of the bowl. This carving should be done using push cuts with the carving knife. You can start off a little bit aggressive but make sure you rein it is as the outside of the bowl quickly starts to take shape. Ensure that you frequently check the thickness of the bottom and sides to keep things even. Make sure you do not punch through the wall of the bowl! Again, one of the most time consuming steps, but necessary to remove all the uneven edges. You may use the same assembly of grits to sand it down that was mentioned for the spoon, moving from roughest to finest grit as you progress. A nice touch to add is melting beeswax and mineral oil together then lathering it over the wood brings a classic color to the final product. As you can see, carving a spoon or bowl is a relatively easy task that does not require a lot of time, material, or money. People of all ages can master this skill, you never know when it may come in handy! I encourage you to give it a try and let me know how it goes. Good luck whittling! Bushcraft Basics – A comprehensive overview of the discipline of bushcraft including how to get started, the tools you need, and project ideas. Click here to read the article. Woodworking Basics: Mastering The Essentials Of Craftsmanship – A great book on the subject that covers all the bases on getting started and tools needed. Click Here to check it out. Click on the image to get access to 16,000 woodworking projects complete with step by step tutorials! Have you ever carved a tool out of wood? What was it? Do you have any wood carving tips or tricks that you would like to share? Let us know in the Comments Section below, thanks! Nathan began wood carving 6 years ago with just a basic pocket knife while camping. He ended up thoroughly enjoying the craft and learned everything he could about it. He’s come to learn various methods to carving wood while discovering the best techniques to give to those looking to start and even veterans like himself.